OXFORD, Miss. 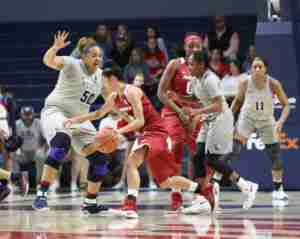 – On Sunday, after his Arkansas team fell to the Rebels, Razorbacks’ head coach Jimmy Dykes said he saw something different in this year’s Ole Miss women’s basketball team. In Ole Miss’ 73-64 victory over the Razorbacks in both programs’ Southeastern Conference opener, Dykes and his Razorbacks witnessed tremendous presence from the post position of the Rebels, stemming from the additions of Taylor Manuel and Shelby Gibson to returning players Shequila Joseph, Cecilia Muhate and Bretta Hart. A season ago, the Rebels lost 60-49 to Arkansas in Fayetteville and shot 27.9 percent (19 of 68) from the field, including 6 of 27 from 3-point range. Joseph, Muhate, and Hart combined to score 10 points on 4 of 11 shooting. The trio also grabbed 21 rebounds. 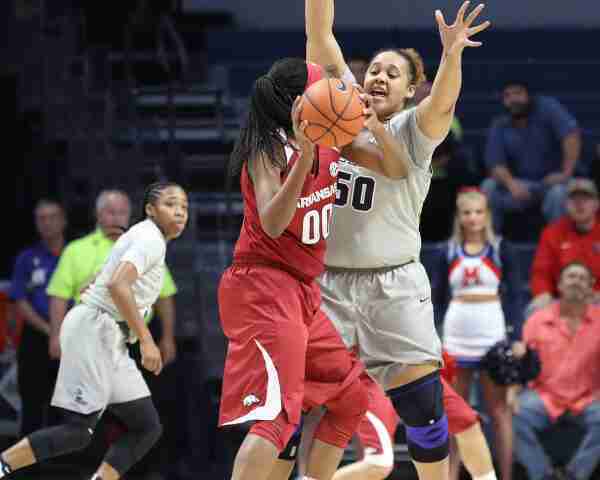 But this past Sunday, Ole Miss had more balance and better luck against the Razorbacks, going 30 for 72 from the field, out-rebounding Arkansas, 50-33. Dykes, who is in his third season coaching the Razorbacks, thinks the Rebels are a much tougher opponent than last year because of the Ole Miss post players. In Sunday’s win, Joseph finished with 15 points on 7 of 13 shooting and grabbed a career-best 13 rebounds, her second career double-double and fourth double-double for Ole Miss this season. Gibson added 12 points on 5 of 9 shooting, and snagged five rebounds. 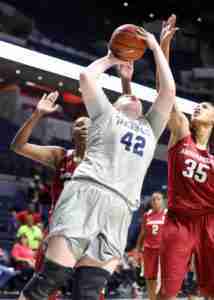 Manuel finished with six points and six rebounds, and Arkansas definitely felt her physicality as she helped the Rebels make things difficult for the Razorbacks’ leading scorer, Jessica Jackson, who managed only 11 points on 3 of 15 shooting. “They are a good ball club,” Dykes said. “Their inside play,” Dykes quickly said, while looking at the final box score. Last season, before the arrival of Gibson and Manuel, Ole Miss head coach Matt Insell reiterated after each loss in league play that the Rebels would be a much better team in the 2016-17 college basketball season. Insell said that even before Manuel announced her pledge to transfer from Loyola Chicago last June. Now, Insell’s predictions have turned into solid production on the floor. Ole Miss is currently sitting at 12-2 overall (1-0 in the SEC), and quite possibly could be an elite contender in the conference if things continue to go as planned. Ole Miss and Alabama (12-2, 0-1) are meeting for the 57th time tonight (7:00 p.m., SEC+ ) with the Rebels leading the series, 34-22. The Crimson Tide won the last meeting, 47-38, in Tuscaloosa, and owns a 3-1 advantage in the last four meetings. Alabama leads the series, 13-11, at home. The last time Ole Miss won in Tuscaloosa was a 69-55 win in 2012.